NEW YORK, July 3, 2018 /PRNewswire/ -- Olives from Spain has launched "Have an Olive Day," a new campaign for the US market. The campaign aims to encourage American consumers to "live every day as an olive day," rediscovering the quality of Mediterranean olives and sharing in their versatility and variety. The recent Summer Fancy Food Show, held June 30 to July 2 in New York, provided the perfect opportunity to highlight table olives' infinite gastronomic possibilities to consumers and professionals. Summer Fancy Food is one of the most important gastronomic fairs for the US's HORECA sector (hotels, restaurants and caterings), with over 17,000 professional attendees each year. During the three-day event, attendees were able to enjoy firsthand all the different tastes and varieties of European olives, with original dressings provided by chef Alberto Astudillo. Representatives of Olives from Spain delighted in sharing facts about different verities as well as providing ideas for traditional dishes featuring olives. Each year, the US imports more than 155 million lbs of European olives, reaching more than 120 US markets. In fact, 95 percent of stuffed pimiento olives consumed by Americans come from Spain. In spite of this, many consumers are unaware of the full gastronomic potential offered by olives. Thanks to their enormous variety and versatility, olives can be used to create all kinds of recipes, from the simplest appetizers to the most elaborate dishes. 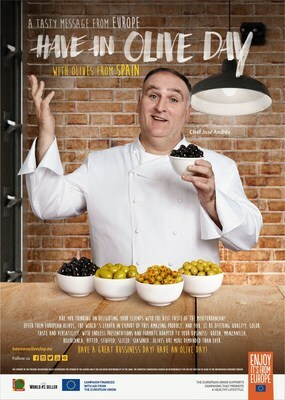 Featuring the support of prestigious chef José Andrés and backed by an investment of 7.5 million euros over three years, the "Have an Olive Day" campaign aims to redefine American consumers' ideas about olives, inspiring them to discover the culinary versatility that has made it a timeless staple of the Mediterranean diet. Popular Spanish chef José Andrés is known as a "professional improviser" in the kitchen, a lover of olives and a faithful defender of the Mediterranean diet in the USA for more than 20 years. Throughout all this time, not only has he created and managed the some of the most successful restaurants, he has also become a well-known presenter of popular television programs, defending healthy foods and habits. This earned him a spot on the list of the 100 most influential people in the world in Time magazine in 2012 and 2018. In addition, Andrés has just been named Humanitarian of the Year by the James Beard Foundation. INTERACEITUNA is the Interprofessional Organization of Table Olives, recognized by the Ministry of Agriculture, Fisheries, Food and Environment that represents the whole sector producing, processing and marketing table olives. Created to implement different programs and activities of general interest, INTERACEITUNA promotes knowledge of Spanish table olives and carries out research and development related to production and production techniques. INTERACEITUNA has partnered with the European Union to promote this product.